With 216 square meter of cleanliness, the new clean room of the Geneva Observatory is the largest in the French-speaking part of Switzerland. It was approved on 16th December and received ESPRESSO, its first tenant, early January. 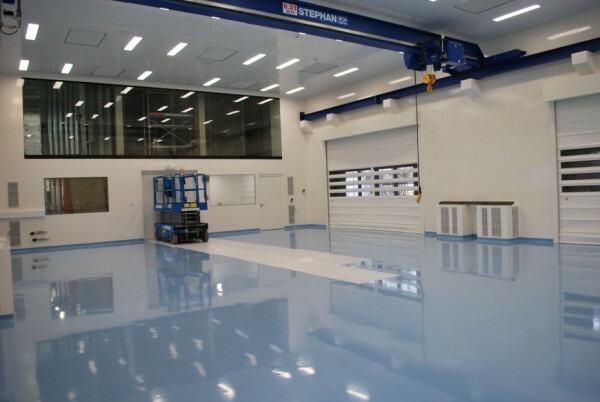 This clean room, located in the new Observatory building (to be completed in June 2016) is Atmosphere Zone Controlled (AZC) responding to ISO 7 international standards. This means that the room should not contain more than 2’930 particles of dust over 5mum (micrometer), 83’000 of 1mum, 352’000 of 0.5mum and unrestricted for smaller. In comparison, the atmosphere in the Geneva Observatory area contains about 1’000 to 10’000 times more of these particles (depending on the weather) and a ISO4 classroom (such as the Johnson Space Center where NASA space probes are assembled) contains 1’000 times less. The Observatory clean room is equipped with a 6’300 kg crane capable of serving the entire surface, a needed lifting force as some elements of ESPRESSO such as the tank or the optical bench weigh about four tons. The temperature and humidity conditions are also controlled; the temperature can be adjusted between 15 and 20 degrees plus or minus 0.25 degrees and the humidity between 20 and 80%. Video of the reception of the ESPRESSO’s Vacuum chamber in the new clean room of Geneva Observatory. ESPRESSO, which was eagerly awaited by all PlanetS NCCR exoplanets hunters, was the first instrument integrated in this new clean room. The Management of the Observatory deemed the construction of this room necessary. In fact as the institute’s reputation in terms of instrumental expertise is internationally recognized, this clean room was needed to meet the growing demand. The waiting list for other projects, such as NIRPS for example, is already in the process of filling up (see The Observer). A clean room requires many constraints for those working there, including having to change clothes as they enter and exit. To avoid this kind of inconvenience to visitors and members of consortia instruments, a large mezzanine was built to enable them to view ongoing operations. The mezzanine is also connected to the video conference room located on the upper floor. ESPRESSO and its followers can therefore be monitored from anywhere in the world, without having to be moved or changed.